Grow Green – Eco Ideas for the Garden! At True Blue we’re committed to the ecological health of our community, our country and the planet. We practice sustainable growth – meeting the needs of the present without comprising future generation’s ability to meet their own needs. We support growers and suppliers who share our concerns and promise towards ‘green’ solutions to the reduction of greenhouse gas, energy consumption and post consumer waste. Click on each individual link to learn more about our programs. Reuse, Renew and Recycle: We recycle all pots, baskets, flats and other plastics both that we use, and that others bring back to us. By recycling we can extend the life of a pot or flat by about 3-4 years. We also recycle soda cans and other recyclables throughout the garden center. Organic Alternatives: We offer safe solutions for pest and disease control through organic fertilizers, compost and natural pest control. Although we are not certified as a commercial organic grower, we do not now, nor have we ever used sprays or chemicals on our edible plants. This includes vegetables and herbs. The chemicals that we do use are low impact. We use no RUP’s- restricted use pesticides. Native Plants: We offer a wide selection of native plants designed to reduce the need for fertilizers, and chemical pest and disease control products. Native plants also provide support for beneficial insects such as bees and butterflies. We would like to encourage homeowners to replace turf with ornamental grasses, native perennials and other water-wise alternatives. Green Building: We’ve replaced outdated fiberglass off of both the greenhouses and retail areas and replaced it with new, polycarbonate sheeting. This eliminates any possible chemical hazards associated with fiberglass and decreases our demand for energy in the winter months. We’ve also installed a new, state of the art, energy efficient heating system that will also decrease our demand for energy, thereby conserving fuel. Greener Holiday Lighting: We’ve replaced lights, especially many of the lights in our Christmas shop with LED lights which use up to 80-90% less energy. 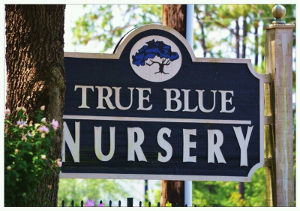 Plant a Tree: At True Blue we feature a wide selection of shade and evergreen trees. Depending on location, species, size, and condition, shade from trees can reduce utility bills for air conditioning in residential and commercial buildings by 15-50 percent. Trees, through their shade and transpiration, provide natural “low-tech” cooling that means less need to build additional dams, power plants, and nuclear generators. Trees also reduce carbon, noise levels, and water runoff while improving air quality.